May 26, 2014, Toronto, ON–If you’ve ever wondered whether supporting Canadian Feed The Children’s capacity building work with local partners pays off, wonder no more. In the last month, we’ve learned from two partners that they’ve received significant grants from two separate, and high-profile, funding agencies. Both partners attribute their success directly to the learning, networking and organization-building opportunities that Canadian Feed The Children has made available as a routine part of our work with them. 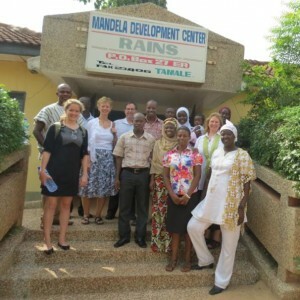 CEDO (Child Rights Empowerment and Development Organization) in Uganda and RAINS (Regional Advisory & Information Network Systems) in Ghana have both just received major grants from USAID and Comic Relief, respectively. Regional Program Manager-Africa, Amboka Wameyo (left), stands with Byabasaija Abdallah (centre, with notebook) and staff in Uganda. 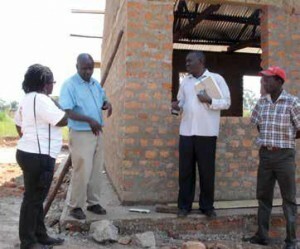 CEDO’s funding from USAID is to implement a governance, participation and accountability project across 16 sub-counties in Masindi and Buliisa Districts in Uganda over the next two years. The project begins April 2014 and will run until March 2016. Similarly, RAINS has earned a large grant from Comic Relief, the U.K.-based poverty alleviation charity. Previously funded by the organization for a different project and at a much lower level, RAINS was able to secure another Comic Relief grant specifically because of the strategies they’ve learned and implemented as part of the work they’ve been involved with through CFTC: the CHANGE (Climate Change Adaptation in Northern Ghana Enhanced) project and the implementation of village savings and loans association (brought to RAINS by work done by CFTC partners in Ethiopia and Uganda). Receiving grants of this size from these well-established organizations is both a testament to the strength built in these two organizations, and will also ensure their ongoing growth. CFTC takes great pride in having helped CEDO and RAINS gain the capacity needed to receive these grants. CFTC’s supporters can share that pride, knowing that their support has contributed to expanding these partners’ abilities to reach even more children and families and improve their lives.